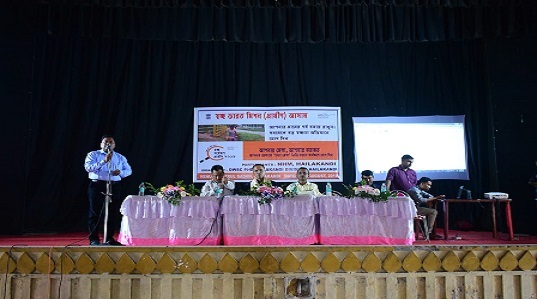 A convergence meeting on Swachh Survekshan Grameen 2018 (SSG 18) was held to achieve the goals of making Hailakandi the cleanest district of the country. Speaking on the occasion, additional deputy commissioner of health EL Fairhiem said the survekshan is really important for the cause of swachhata and is a holistic campaign that will determine the progress of sanitation and cleanliness in rural areas of Hailakandi district. He exhorted upon the line departments to work in tandem for making Hailakandi the cleanest district of the country. PHED superintending engineer Nurzzaman Choudhury urged the officials to seriously play an active role during the survey. Joint Director, Health Services, Dr Avijit Basu, SDO (Sadar), Prodip Timung and district media expert, Monica Das also spoke on the occasion. Under the survey, a range of parameters are being applied to rank villages and districts. District level surveys of public places like schools, anganwadis, primary heath care centres, markets and panchayats are being conducted to check the status of sanitation facilities available in these places. Citizens’ perception on swachhata is taken into account during the survey. Hailakandi, one of the 115 aspirational districts of India, has 331 villages and 62 gaon panchayats with a population of a little over 6.59 lakh as per 2011 Census.